Nothing about the new life in Christ is realistic. Everything about it pushes the standard limitations we place on what is possible. Approaching the word of God and how it applies in this world is completely unrealistic from the reality established by the world we have been raised by. Everything about the new life in Christ calls us to expect what our world teaches us to never expect. The world leads us to believe that certain things are not to be expected, that certain things are out of the range of possibility, and certain things simply cannot be. The concept of genuine selfless love for another is clouded by our belief that the limits of our human hearts can neither handle nor be expected to exhibit such unrealistic love. The concept of complete abandonment to an authority that has the power to permanently change us from paralyzing insecurity to confidence and contentment is not realistically possible. We are wary of anything that might tempt us out of the real world and into a mere fantasy state. There is no synchronicity between the new life in Christ and the life we were born into in this world. The two lives are in a state of constant contradiction. The more one is overcome by the transforming power of the Holy Spirit, the more one begins to perceive oneself as a “stranger” in this world. A stranger that has a home somewhere else, but is nonetheless in this world with a job to do. That job is not to reproduce or replicate the power of the Holy Spirit in the lives of others. That job is to simply bear witness to the power of the Holy Spirit in our own life. One cannot simply share the expectations of the Gospel with another and expect that those expectations be received, followed and cherished. Rather, they are completely unrealistic and should receive an adverse reaction. If one is listening and understanding the implications of the words of the Gospel, these words are not liberating. To begin with, they are crushing by the magnitude of what they expect from us. They are unrealistic and impossible. They should not be taken seriously— if the words are the only witness. However, witnessing the transforming power of the Holy Spirit in the life of another suddenly opens the door of possibility. The real-time power of the spirit of Christ in man is the only witness that can effectively lead a person from utter desperation in the face of the Gospel’s expectations to complete satisfaction and hope. 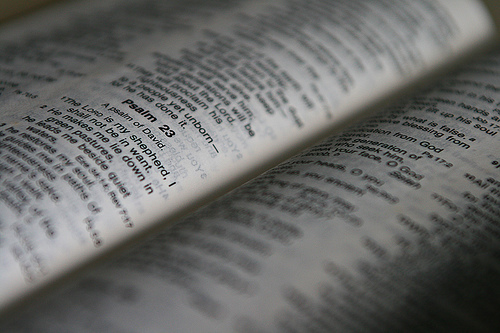 We are not meant to read the words of God as one reads literature. Literature is from man and for man and thus will be received by man as man would naturally receive it. The words of God are from God, for man. They will shake us, press us and ultimately change us. Our expectations when standing in the presence of God must only be to expect something entirely different from ourselves. However, what we should expect to find is beyond our reality and supernaturally good. The Reflection Series for this month is adapted from Reasoning the Rest, which you can read or download from the main menu. This month, we’re discussing how we can trust the Bible as the inspired Word of God. The Christian belief that the Bible is the inspired Word of God is rooted in four aspects of the Bible. This week, let’s look at how the promises of God help us trust the Bible as God’s Word. Our limitations were explained in last week’s reflection, however, one more aspect of our inability to “know” is worth noting. Although our passions and dreams encourage us to do and know more, the reality of our humanness is that more often than not we can’t do more, and we have no ideas or inspirations. The suggestion to know the outcome of a particular situation premature of its conclusion is foolish, given our limitation of foresight and foreknowledge. Thus, we are reduced to making educated guesses and assumptions— nothing of weight in regards to truth or certainty. Once again, the Bible sets itself apart as a collection of promises, made during times where not nearly enough fact or information is present to support them, consistently fulfilled. There is something uniquely powerful, and also terrifying, about how much God professes to know in the Bible. There is a casual confidence that emerges from the pages of the Bible as God reflects on his plan and the way in which he has, is, or is planning to carry it out, regardless of the will or abilities of man. The casual and almost hypnotic redundancy and consistency of God’s plans and methods throughout the Bible is at a casual glance unimpressive and some might say tired and unimaginative. However, once one understands that this Word is not telling a fictitious story but is telling the history of real people, real places and is still in effect in our present age, one is suddenly and violently thrust from a view of the Word as boring or predictable to an understanding that God has known all along what he was going to do, what he had to do and what he intends to finish. There is something radically different in the way a person is transformed by the Gospel of Jesus Christ versus the way they naturally mature or alter their behavior over time. As people age, inevitable changes occur. These changes can vary from the slight to the dramatic, but they can be followed with relative ease. Observing a person’s growth over a given period of time is like tracking a sequence of interconnected dots. There is a well-established understanding in human development that while some changes give cause for some consideration, there is often a relatively simple explanation as to how or why the change occurred. This is not to belittle the change; it is simply to address the fact that human change is relatively predictable. But a person confronted by the Gospel truth of Jesus Christ who yields to the authority of said truths experiences a transformation rather different than the traditional course of maturity or human development. The transformation of a person by the Gospel of Jesus Christ is nothing short of supernatural. The changes in the person are inexplicable. They defy logic. Moreover, these changes are real. They do not come and go like a phase. They are roots that are planted deep and yield consistently good fruit. As the Gospel of Jesus Christ transforms a person, the desires and interests of their old self are radically transformed as well. The desires that used to satisfy now fall pitifully short of satisfaction. While the old self clung to certain idols of the heart with stubborn persistence, the new self becomes aware that these old desires never truly satisfied and only bring distance from the God that has satisfied the self so completely. True transformation by the Gospel can be measured in many ways, but one way is in how ready we are to hold on and how ready we are to let go. If the desires of our old self continue to convince us of their power to fill our cup, we have not yet made room for God to fill it. If the desires of our old self become to us slithering snakes or poisonous spiders that we are quick to let go of, we can be encouraged that the truths of the Gospel are in fact transforming us.